27 individual »concrete slabs« each with a surface area of 60 x 30 mm to construct a concrete roadway with a length of more than 80 cm. For the designing of curves, junctions, railroad overpasses etc. more than 40 smaller partial trapezoidal pieces are included. 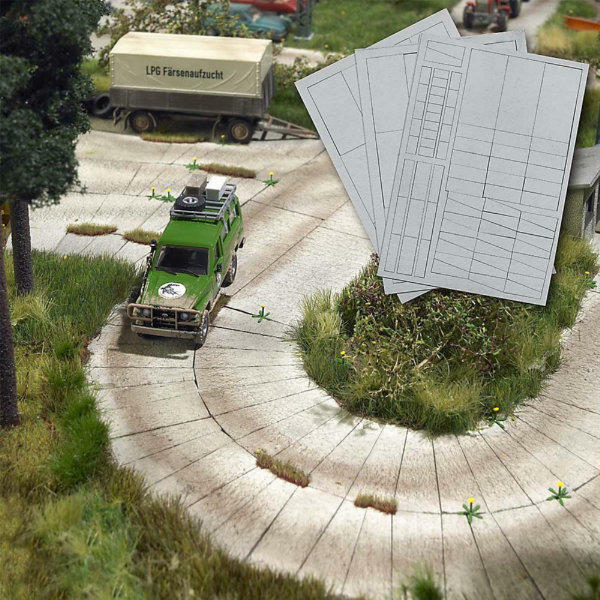 The material is easy to handle: Apply »concrete slabs« to your diorama base, mark out the lanes with some colour, or alternatively add some grass material and dandelions to finish an old concrete road.